Introducing the ALL-NEW Shariah Program ARB 101 Course! Yusuf Mullan here. If you are reading this right now, chances are you already feel a strong urge to learn the Arabic language. For many, it has to do with religious reasons. You feel a strong itching in your heart that irritates you when you can’t understand your prayers. You long for the day when you, too, will speak Arabic and listen to scholars and understand them at their level. For others, it has to do with community reasons. You have friends or family whom you feel closed off to because you can’t speak in their language, on their terms. And you feel defeated because you just don’t have the language. Well, don’t worry; it turns out that in most cases where students don’t see any results, it is not their fault. Instead, the problem is the curriculums they are forced to study. The curriculums are old and aren’t designed to take advantage of productivity rules, so a lot of time is wasted. They aren’t designed to utilize advanced learning patterns, so many students don’t see the eye-popping results they hope for. And they don’t hone in on pedagogical techniques, so the language seems hard to learn when it really isn’t. The secret to learning scholarly Arabic in a timely, manageable and enjoyable way is that you have to have a smart curriculum. That’s why I had my long term student (and great teacher in his own right), Ustadh Mohtanick Jamil, spend 6 grueling months creating the ARB 101 Course. Ustadh Mohtanick started studying with me when he was just 16. I’m really proud of everything he’s accomplished, teaching hundreds and soon thousands of students. And he’s done all this while facing more challenges than most, as Ustadh Mohtanick is actually legally blind. He uses a software called “Zoom”. (He can’t function without it). Anyway – in creating this comprehensive course, he’s left no stone unturned and no angel uncovered. This 11 hour course uses a revolutionary curriculum based on the Fundamentals Criterion Principle, which is designed to teach scholarly material in a manageable (and even easy) way. It’s designed for students who have absolutely no exposure to Arabic and want to learn some serious concepts better than advanced students. Again, it sounds like nothing any course has been able to fully achieve. But there’s really no magic to it. You just have to be smart and listen to what the students need and design a curriculum appropriate for the times. And that’s what we did. And, Alhmadulillah, the effective results we are seeing in our students is inspiring, and it gives us hope that perhaps the centuries-old scholar of the Islamic Golden Age is once again slowly coming back to life. And the results just don’t lie! Completely online & completely self-paced: Because it’s a home-study program, you can start and stop whenever you feel in the mood. And because it’s meant for beginners, it doesn’t matter how much or how little you study in each session. That’s because the course is designed with this in mind. We feel this course will give you a lot of freedom. Plus, because it’s online, you are granted access immediately and you are able to learn with your family and children at home or anywhere you want. The lectures are video-based: Each lesson has a video lecture between 20 and 60 minutes in length. This makes it really easy because all you have to do is listen to the instructor and watch what is written on the slides. We think it’s great also because it allows you to watch with your family and kids and engage them in the learning. Practice exercises with answers: Most lessons have accompanying PDF exercises you can print out and do. This is great because it helps solidify what you learn in the lectures and it helps activate new vocabulary. What’s particularly useful is that each exercise has answers provided to you so you can always check your work and you’ll never wonder whether you’re doing it right or wrong. This is helpful for everyone, but particularly for students with poor memories because each new lesson is reinforced and repeated. Slides (& transcripts) provided: You will be provided with PDF slides for each lesson. These are a superb study guide and allow you to follow along effortlessly. We are also currently working on providing a transcript of the lectures for each lesson. This will automatically be made available to all students (new and current) in the class portal. Learn to read Arabic: You’ll learn to read Arabic script better than most advanced students because you’ll see the teacher read words, phrases and eventually entire sentences and you will be asked to follow along. This course assumes you know ZERO Arabic. And it teaches you slowly until you are pretty much guaranteed to become better at reading Arabic script than most advanced students. It really puts you ahead and gives you a big boost. Learn to write Arabic: You’ll learn to write Arabic beautifully because you’ll watch the scribe write in front of your very eyes on the screen. You start small with letters, then you move on to words and eventually sentences. If you do the practice exercises, your writing is guaranteed to be better than most advanced students. That’s because nowadays, Arabic students are not taught penmanship and writing in schools and Madrasas. But this course gives you those skills and it makes it super easy. Learn to pronounce with correct Tajweed: You’ll learn to pronounce Arabic exactly as it is supposed to be pronounced. That’s because a lot of attention is given to this topic in the course. You will hear the instructor pronounce each letter until you understand it perfectly. In fact, the course includes an entire lesson (a pretty long one) just about how to move your tongue in order to pronounce each letter. 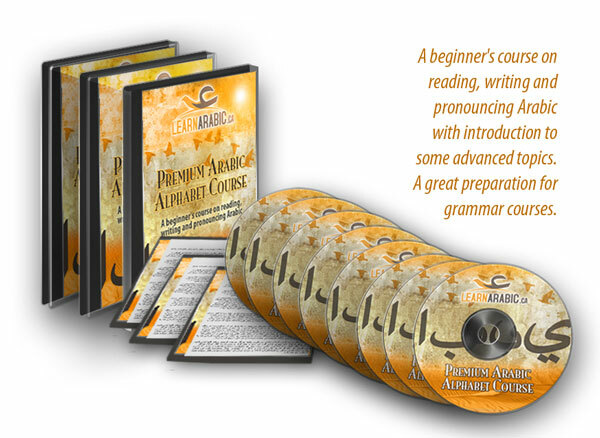 Learn basic grammar & vocab: You will learn to speak basic Arabic with incredible ease because the course includes an 8-lesson bonus that goes through the basics of grammar and morphology. These are the basic tools you need to form Arabic sentences and simple phrases and begin speaking in a matter of weeks. It is the easiest course on the market: This course is guaranteed to be easier than any other online or on-campus course. That’s because it uses a new curriculum style based on the Fundamentals Criterion Principle (FCP) developed by Sr. Curriculum Director, Mohtanick Jamil. The course can take you from never having seen an Arabic letter to being better than most advanced students in as much or as little time as you decide. … then we’d like to invite you to review our pricing below and click the “Add to Cart” button to get started immediately. ARB 101 offers the highest education using a revolutionary curriculum that makes it easy. You get an incredible amount of concepts presented in a manageable way. But the primary purpose of this course is to put the beginner student at the head of the game, way past even the best students. That’s the reason we designed this course, that’s our mantra. So, in order to further this cause, we’ve included an 8-lesson bonus valued at $197 USD that goes beyond the foundations and gets into the grammar, the morphology and other exciting areas of the language. The lessons still use the FCP curriculum, so it is super easy yet hyper-educational. … then all you have to do is send us a single email, and we will refund every penny you paid without hassles and without delay. Really. What this means is that you can watch all the videos, take notes, take all the tests, put all the lessons to work for you and gain the maximum benefit from all the resources, meaning complete the entire course BEFORE you even decide to keep it. We’re so confident that you’ll be thrilled and will want to share it with all your immediate family members (at no extra cost btw), that we’re able to offer this remarkably generous guarantee. We encourage you to take advantage of this opportunity and follow your goal of learning Arabic. We have done all we can. It is up to you now to take that step and put in the effort required to start learning Arabic. When you click the button below, you’ll be taken to the payment options page. You can choose the full-pay option. You may also split the payment into 3 equal installments of just $97. Click the button below to begin the process now. See you on the other side… ! Q: I already know the alphabet. I studied it in childhood. Should I still sign up for this? A: We’ve had a Hafiz of the Quran (see testimonial on side bar of this page) that took this course and he gave a glowing testimonial and mentions what great value he received. So though the course is designed for people with no exposure to the Arabic language, i.e. absolute beginners that may not have seen an Arabic letter before, intermediate students may also benefit. The course is very comprehensive. If you’re still unsure, you can test it out by signing up and then cancelling out through the guarantee if you feel it wasn’t what you expected. Q: I already know the alphabet and feel my time and money would be better spent with something more advanced. What would you recommend? A: You’re ready to join the main 2-Year Shariah Program online Arabic classes details of which can be accessed through the header navigation menu at the top of this page. In particular, the “self-paced” version of the program might be appropriate for your needs. Click here to read about the main Shariah Program 2-Year program. Advanced lessons included plus intro to grammar & tons of vocab. I just wanted to … show my full appreciation and thanks to you for providing us with such a wonderful and beneficial Arabic course. I just completed … all the modules and exercises yesterday evening and have already learned so much from the course. Whilst I would originally say that the course was expensive to purchase, I can now easily say it was definitely worth the money! I particularly enjoyed the last lesson on stress patterns. I completed my hifz studies in 1999 and have led taraweeh prayers on numerous occasions and read the Quran on a daily basis but it is just now from your course, the first time I’ve been introduced to this concept and Alhamdulillah I enjoyed and benefited from it very much. I know your advice to the advanced students was to complete the course in 3 weeks but I was too eager to learn more and more :). Also, your voice in the recordings was very easy to understand and follow (something which in other online Arabic courses I have undertaken could not hear the instructor very well)…. Thank you once again for all your efforts and hard work! I was unable to find a course like yours anywhere else in the world! This is brilliant. over the last 55 years I’ve started trying to learn Arabic about 5 times and always got stuck on the alphabet. Once I even managed to write Arabic so an Arab friend could read it, but I couldn’t read back what I’d written. Now I think with this course I’m cracking it! The course is expensive, but I think it will open the way for me to use the other materials I have not been able to use. Many thanks! The differences in pronouncing the vowels is so minute but very informative to know! Normally we don’t notice this difference when pronouncing words but it’s nice to know it exists. Shows how detailed the course really is! Mashallah I am enjoying this course very much. Although an advanced student who is studying Book 3 of the Medinah Arabic Course, knowing how the Hamza is written and on what letter was so simple to understand in this lesson and helped me in my studies very much! Keep up the great work! Alhamdulilah! This is probably the best lesson of the whole course! I listen to Qari’s all the time and recite the Quran on a daily basis and for the first time in my life I have the learnt the importance of using correct stress patterns. It was a real eye opener! May Allah reward you for all your efforts inshallah!